Ask fellow campers about "Ponderosa Campground" and nearby attractions. in the last week Do NOT stay here if you have children. The owner has a small dog that she chains up to a golf cart at the front office that is UNVACCINATED and violent. The owner encouraged my children to pet the dog insisting it was "friendly and loved kids" and while I was standing right beside my children and the owner the dog lunged at my one year old daughters face unprovoked. The owner wouldn't call 911 despite my yelling for her to call and kept insisting it was just a scratch. I called 911 and my child was transported to the nearest hospital and we were told she would need to be put under anesthesia and sewn up by a plastic surgeon. We had to drive 3 hours to the nearest hospital with a plastic surgeon and had to watch our beautiful baby get put under anesthesia and sewn up. The owner refuses to put the dog down despite the harm it could cause another child or adult for that matter! Please learn from Our mistake in staying at a poorly run campground by someone who clearly has no morals. 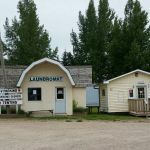 The laundry building had broken windows and was covered in spider webs and had no air conditioning so on a hot day it was unbearable to be inside. We did 3 loads of laundry (only 2 washers and 2 dryers) and one of the dryers wasn't working properly and cost us 4$ just to dry one load. The "park" was a swing set that most of the swings were wrapped around the top so much you couldn't use them, a slide that looked like a death trap with rotted wood and a teeter totter. There was absolutely nothing appealing about this rv campground. Owner wasn't in office very often and needed to be called to come to office. Also double charged us and needed us to come back to reimburse us. We camped at Ponderosa Campground in a Travel Trailer. Found the campgrounds met our needs and enjoyed our stay. Well maintained with large shade trees to park under. Overall a good but older campground and would stay there again. We camped at Ponderosa Campground in a Fifth Wheel. Very close to shopping less than 5 minites away. Based on ratings and reviews, we weren't expecting much and that's what we got, so it was fine for an overnight stay. Staff was friendly. Sites were gravel and mostly level. Utilities were not so good. We had to go under our rig and to the adjacent site and share their pedestal to get 50 amp. Receptacle was a good 3 feet off the ground and horizontal, not vertical, so we had to prop our cord/surge protector on the picnic table to hold the weight. Sewer was accessed under a plywood cover. Water pressure was about 35 psi. No cable or over the air. The shining star was the WiFi: awesome, and what a surprise. The bathroom was old and needs work. We camped at Ponderosa Campground in a Motorhome. Grumpy greeting by office manager. No warmth, just straight business. We did receive site by creek as requested but Trans Canada Hwy makes a turn along the far side of campground so was not super quiet. We camped at Ponderosa Campground in a Travel Trailer. Just pulled in, had dinner, went to bed, staying overnight. Easy exit from highway. Have mosquito repellant. We are full time RVers and stayed here for two days. The Staff is very friendly. This park is an older park as many are on the road, but is quite adequate. We traveled in Canada for 30 days and of all our Parks in the entire region, this park had the BEST Wifi system by far. This is not a resort park but found lots of shade and room for our stay. We would definitely stay again. We camped at Ponderosa Campground in a Fifth Wheel. Peaceful town with convenient shopping. With the Wifi and close proximity to Moose Jaw you will enjoy your stay. If in a tent or a pop up tent trailer, stay away. Right beside Trans Canada with only a short wall of empty containers to "muffle" the noise from the highway. Also at base of hill east bound out of Swift Current. Truckers use jake brakes downhill. Also has a population of feral cats that are friendly enough but are a pest and a nuisance all night. We camped at Ponderosa Campground in a Tent Trailer. We made these reservations more than 6 months in advance, asked for pull through full hookup. When we checked in, we were told they didn't have anymore sites like that! Well, they did have one, but the sewer didn't work because the previous user plugged it up. So in order to get 50 amp, we had to unhook the toad and back in. There was a HUGE propane tank on the site that was about 2 feet from the front end of the motor home. There are a lot of "homesteaders" there and we were happy to stay only one night. We camped at Ponderosa Campground in a Motorhome. We stayed for one night one our way through to the east coast of Canada. It was adequate for our stay, nothing fancy, but the washrooms and showers were clean. It was right next to a highway, so a little noisy, but for one night it was fine. Easy access to our site, but rather cramped with not much space between sites. We would stay here again. We camped at Ponderosa Campground in a Motorhome. They advertise Internet Access online but there's no WiFi or Internet Access from the Site or the Office that we could determine. Very disappointing place. Messy and junk strewn around everywhere. This might be the time of year perhaps(early Spring) but the lady told us she took over 1.5 years ago and a clean-up should have happened by now. The place just looks shoddy and run down. I would not stay here again unless it was just overnight as our stay was this time. Having no Internet Access, in a City like Swift Current, just isn't acceptable in a Campground. We camped at Ponderosa Campground in a Travel Trailer. This campsite has it's pros and cons. The washrooms are clean and the owner is friendly. The campsite is right next to the highway and is noisy. We stayed here for convenience only. We camped at Ponderosa Campground in a Truck Camper. 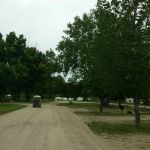 Park is mainly a trailer park with a few very small sites RV sites. They Playground consisted of a large swing set, lawn swing and a small slide. OK for a night while traveling but not a great place to stay for a while. We camped at Ponderosa Campground in a Travel Trailer. Nicely greeting upon arrival and escorted to our site. Sites need to be reconfigured to accommodate for today's slide-outs, our site was incredible tight. We had to move the picnic table in order to make room for our neighbor. There is only one bathroom/shower building and not conveniently located for all campers. If this is something you need close by you may want to request that up front. Toilets are not recommended to be flushed during showers. I cannot comment on why as I showered in my trailer. For a night, very conveniently located right off the highway. WiFi was horrible and would not work for us. For a night, okay. Not for long term stay. We camped at Ponderosa Campground in a Travel Trailer. We were hightly disappointed in this campground. The overall campground is quite nice but the manager of the park is not management material. She parties loudly with other men who are long tern tenants of the park and is quite irresponsible and rude when asked to get people to quiet down. I would not recommend staying at this park if you want family friendly. We are elderly couple who has visited many campgrounds in my life time and this management of this park is highly unethical and non professional. When we go south to Arizona for the winters we usually stay here on our way through and will not be staying after our stay on the way home this June of 2012. We camped at Ponderosa Campground in a Motorhome. This is a good campground. Staff were very friendly and escorted us to our site. They grade all the sites and ours was level. This is the first time we have had a site that was totally level, what a pleasure. They are on city water with lots of pressure so no issues there. Our site was very wide so lots of room for slide-outs and awning. We asked the manager to recommend a restaurant in town for dinner. His choice was great. We had a fine meal and saw the downtown of Swift Current. I used the washrooms and showers at the camp. They were certainly old but have been cleaned and maintained fairly well. No issues here except for very small individual shower stalls. 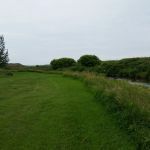 There is lots of good grass for dogs to run on and play. They are pet friendly here. We would certainly return if we are here again. We camped at Ponderosa Campground in a Fifth Wheel. Staff was efficient. We were guided to our site and showed the hookups etc. Laundromat was clean. $2 each for wash and dry. Park was gravel. Sites were level - we didn't unhook the truck. We were allowed to wash our truck and front of the trailer to remove the millions of moths that we picked up. The RV park is adjacent to a mobile home park. We stayed here just overnight. It was convenient to the Trans Canada, easy on and off. We camped at Ponderosa Campground in a Fifth Wheel. 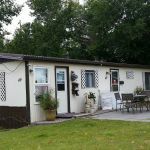 Are you affiliated with Ponderosa Campground ?